[160 Pages Report] The global Network Management System market size was valued to be USD 5.36 billion in 2017 and is projected to reach USD 10.20 billion by 2023, at a Compound Annual Growth Rate (CAGR) of 10.6% during the forecast period. The base year considered for the study is 2017, and the forecast period is 2018–2023. The report aims at estimating the market size and potential of the Network Management System market across segments, such as components (solutions and services), , deployment types, organization size, end-users (service providers and verticals), and regions. The primary objectives of the report are to provide a detailed analysis of the major factors (drivers, restraints, opportunities, industry-specific challenges, and recent developments) influencing the market growth, analyze the market opportunities for stakeholders, and offer details of the competitive landscape to the market leaders. Major players in the global Network Management System market include Accedian (Canada), AppNeta (US), BMC Software (US), CA Technologies (US), Cisco (US), Colasoft (China), Cubro Network Visibility (Austria), ExtraHop Networks (US), Extreme Networks (US), Flowmon Networks (Czech Republic), HelpSystems (US), IBM (US), Ipswitch (US), Juniper Networks (US), Kaseya (Ireland), Kentik (US), LiveAction (US), ManageEngine (US), Micro Focus (UK), NETSCOUT (US), Nokia (Finland), Paessler (Germany), Riverbed Technology (US), SevOne (US), SolarWinds (US), and VIAVI Solutions (US). 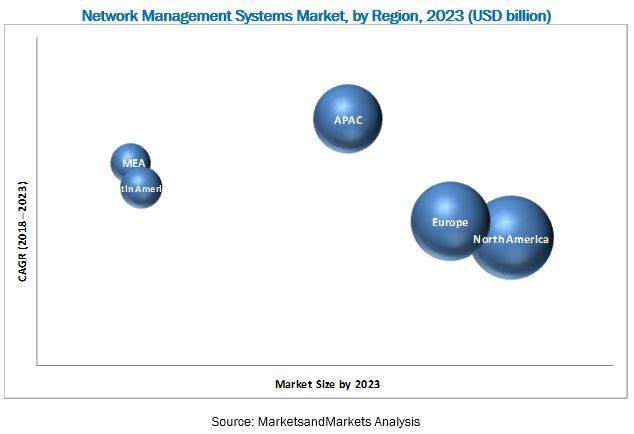 MarketsandMarkets expects the Network Management System market size to grow from USD 6.17 billion in 2018 to USD 10.20 billion by 2023, at a Compound Annual Growth Rate (CAGR) of 10.6% during the forecast period. The global growth of the network infrastructure, network modernization, network optimization; and the need for in-depth network visibility are expected to drive the market growth. The objective of the report is to define, describe, and forecast the Network Management System market size by component (solutions and services), deployment type, end-user (verticals and service providers), organization size, and region. Among components, the solutions segment is expected to account for the larger market share during the forecast period. The overall solution segment includes standalone and bundled network management solutions and has a major influence on the market’s growth. Network Management System solutions help network admin to effectively manage network operation and improve the business performance. Among end-users, the verticals segment is expected to hold the largest market share during the forecast period. Moreover, this segment is significant for solution providers in terms of market share. Banking, finance, government, and manufacturing have always been forefront in adopting Network Management System solutions. It is utmost important for businesses to maintain and upgrade their network infrastructure. All these factors are expected to be the key reason for the rapid adoption of Network Management System solutions and services by vertical. North America is expected to account for the largest size in the Network Management System market during the forecast period, followed by Europe. The region has always been the frontrunner in terms of the technology adoption and digitalization of the society. Enterprises and service providers are continuously changing their network infrastructure to cope with the advanced technologies. The rapid changes in the IT infrastructure, such as cloud and virtualization, have significantly increased the pressure on the network admins to manage the network infrastructure. Hence, the demand for Network Management System solutions is expected to increase across enterprises and service providers. North America is expected to account for the largest market share in the global market during the forecast period. The proliferation of smartphones, increased Distributed Denial of service (DDoS) attacks on networks, and broadband connectivity augmented by the emergence of advanced technologies, such as Internet of Things (IoT), mobility, and cloud services, in APAC are expected to be the major driving forces behind the growing market. Countries constituting a major portion of the market include China, Japan, South Korea, India, and Australia. The budgetary constraints on the Information Technology (IT) investment and the availability of free and open source network management solutions security may hamper the growth of the market, but for a specific period. 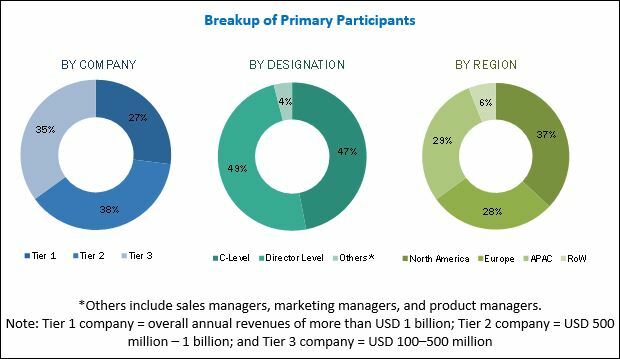 Major and emerging vendors in the Network Management System market includes Accedian (Canada), AppNeta (US), BMC Software (US), CA Technologies (US), Cisco (US), Colasoft (China), Cubro Network Visibility (Austria), ExtraHop Networks (US), Extreme Networks (US), Flowmon Networks (Czech Republic), HelpSystems (US), IBM (US), Ipswitch (US), Juniper Networks (US), Kaseya (Ireland), Kentik (US), LiveAction (US), ManageEngine (US), Micro Focus (UK), NETSCOUT (US), Nokia (Finland), Paessler (Germany), Riverbed Technology (US), SevOne (US), SolarWinds (US), and VIAVI Solutions (US).